Cate Blanchett and Jack Black star along with Owen Vaccaro in The House With a Clock In Its Walls. The latest film from the director of Hostel and Cabin Fever features a house so haunted, it has its own heart. However, despite Eli Roth’s reputation, this isn’t a gory horror movie. It’s produced by Steven Spielberg’s Amblin Entertainment, which means the scares are fun for the whole family! 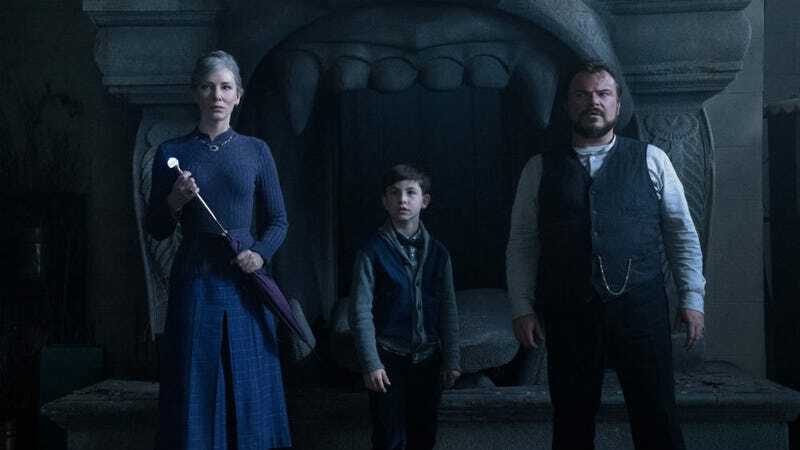 Starring Jack Black and Cate Blanchett, The House With a Clock in Its Walls is based on a children’s book by John Bellairs and illustrated by Edward Gorey. The film is about a young boy who moves to his uncle’s house and unleashes an ancient evil. Here’s the trailer. The first thing I thought after watching that trailer is, “That’s an Eli Roth movie?” Yes. Yes, it is. But it obviously doesn’t have Roth’s signature gore. Instead, it looks more like a Guillermo del Toro movie, with sumptuous production design and creepy creatures walking about. Though the boy, played by Owen Vaccaro, is obviously the star, Black and Blanchett lead an impressive cast that also includes Twin Peaks’ Kyle MacLachlan, Clue’s Colleen Camp, and Hamilton’s Renée Elise Goldsberry. This movie feels like it came out of nowhere but has some serious cachet. The House With a Clock in Its Walls opens September 21.